Sidney Boy Scout Troop 401 held ceremony March 16 in Waterville. Adam DeWitt, 18, of Sidney, received his Eagle Scout medal, patch and certificate on March 16 at St. Mark’s Episcopal Church in Waterville. Dignitaries and Scouting leaders took turns praising DeWitt on his accomplishment achieved by only 141 other young men in Maine last year. Two of those looking on in the audience understand better than most. DeWitt’s brothers Alexander and Spencer are both Eagle Scouts as well. All three DeWitt sons have now reached Scouting’s highest pinnacle. 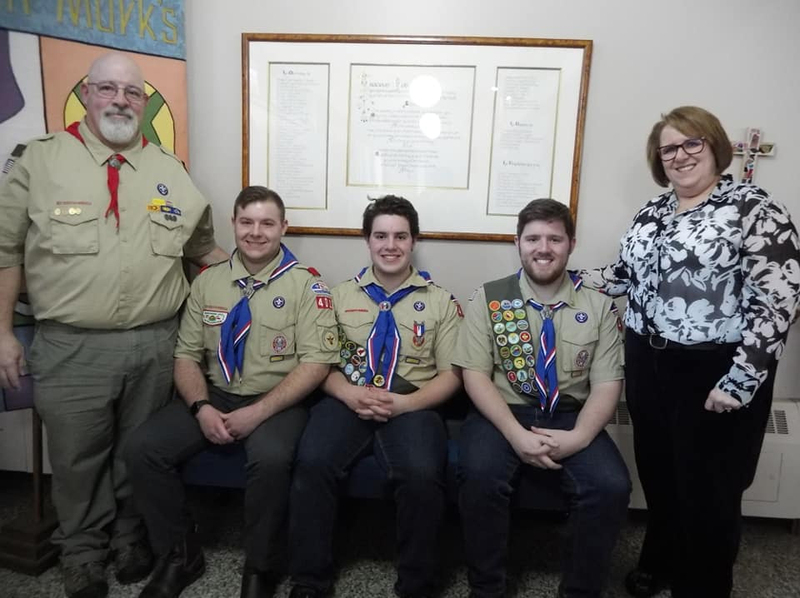 One family with three Eagles is rare but in Troop 401, there now are three such families, according to a news release from Chuck Mahaleris. DeWitt’s project was to develop, promote and put on a concert to benefit the Travis Mills Retreat. He worked with local print, radio and television outlets to generate publicity for the concert that was held at Messalonskee High School. He organized the bands and other musicians and set up the program for the event. Several hundred people attended and the event was covered by print and television media. Along with raising awareness for the retreat for wounded warriors, those who attended also donated a total of $3,000 for Travis Mills’ efforts at the retreat. He recently served as the master of ceremonies for the Pine Tree Council Youth Recognition Luncheon at Camp Hinds which honors all 111 Eagles from last year, according to the release. A senior at Messalonskee High School, DeWitt plans to attend Unity College in the fall in order to become a Maine Warden. DeWitt credits much to his time with Troop 401. “I think my favorite part about Scouting is just being with all of the guys in Troop 401. I’ve been with a couple of them since I joined Cub Scouts. I love going with them on camping trips and camporees and all that,” according to the release.